Corb7 International January 2014 Newsletter | Corb7 International, Inc. Question:Why own a Trust Company? The most common reasons are to gain more control over your business interests and/or to open new avenues of profit. For wealthy families it is often to establish a nest egg in an environment that promotes asset protection. It is, therefore.a captive entity that offers Profit, Privacy and Asset Protection. Question:Do Swiss Trust Companies come with a SWIFT membership? No. And if anyone suggests otherwise that should be a red flag to you. You can certainly apply for membership as a new ownerbut it is a long and expensive process and there will beno guarantee of acceptance. Frankly, the Trust Company should work perfectly fine on its own with quality administration. Question:Are there any Tax Benefits? No. This is not a tax shelter and should not be viewed as such. Corporate tax can be structure to be minimized in Switzerland but worldwide income tax is becoming the norm and profits will likely pass through to your personal obligations. We would always suggest that you consult with yourprofessional adviser. Bermuda’s Annual Captive Insurance Conference is coming June 2 to 4, 2014. This annual conference has offered networking and educational opportunities for over 30 years. A must for Global Risk Financing. You may find their website and conference archives helpful too. Listing your company on a foreign stock exchange has become more attractive as the world market place has turned to 24-hour trading. Clients may find an Offshore IPO an attractive means to raising much needed capital or for an exit strategy. In addition, an Offshore IPO might be much easier and less expensive to accomplish than its domestic counterpart. Thus, it may be perfect for small to mid-size companies from all over the world. 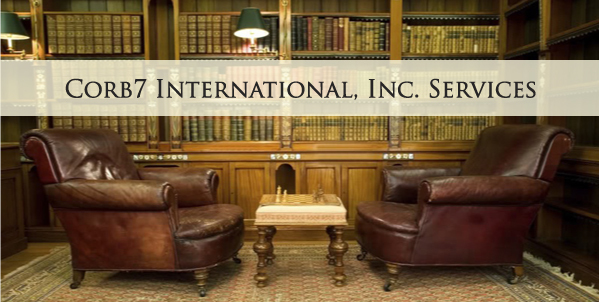 For the benefit of our clients, Corb7 International, Inc. has signed on ongoing affiliate agreement to act as a referring agent with Swiss International Finance Group AG, a renowned firm specializing in capital raises and post-listing services on various European stock exchanges. This firm in particular is special in that both helps clients obtain the initial listing and also has the necessary support network to assist with post IPO services and public relations. If SWIFT sounds like a business tool you could use and you do not have or do not want to own a captive financial entity we may have an alternative for you to consider. It is far less expensive and much quicker.